Cedar Mountain takes pride in building quality spa covers in North Idaho for more than 35 years. 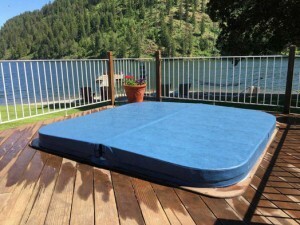 One of our facilities is located just outside of Coeur d’Alene in Hayden, ID which distributes our high quality spa covers to all the spa cover dealers in Kootenai County. Our covers are made to withstand any seasonal weather that the Northwest encounters. Browse the website to see how the covers are made, and undergo a strict quality control process that is not possible from an off-shore assembly line. Coeur d’Alene is located about 30 miles east of Spokane, WA, and has a population nearing 45 thousand people. It is home to the Coeur d’Alene resort which offers amazing views of Coeur d’Alene Lake, fine dining, an exclusive spa, a winery, golf course, access to Tubb’s hill, and more. 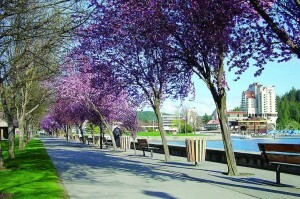 Locals sometimes refer to Coeur d’Alene, as the “Lake City”, or simply refer to the area by its initials, “CDA”. CDA is only a half hour drive from Spokane International Airport, which makes it an easy destination spot to get into, but a hard one to leave because of its charm and beauty. Surrounded by more than 10 natural lakes (that were formed by the melted glaciers left from the ice age) only adds to the beauty of watching the sun set and the moon rise. These lakes are surrounded by wooded land that is protected and managed by the city and state of Idaho. Panorama of Coeur d’Alene from Cougar Bay. The tall building to the far right is the Coeur d’Alene Resort. There are many outdoor and indoor festivities to enjoy, including the Art Walk, comedy nights, and a pie eating contests. In addition, CDA is the home to an Ironman Triathlon, which occurs every fourth Sunday in June. Competitors start with a 2.4 miles swim, followed by a 112 miles bike ride, and finishing strong with a marathon run (26.2 miles). To prepare for this momentous event, there is the annual “Coeur d’Fondo”, which is a bike race that ranges between 15 and 108 miles. Also, there is the “Coeur d’Alene” crossing, which is where swimmers cross the lake, so that the athletes can participate for fun, or to prepare for the Ironman competition. The “Car d’Alene” is a great annual car show that displays new and old cars, for your admiration. Roller Derby is a fun way to spend an evening (the competitive season is between March and November). The Coeur d’Alene Christmas Lighting ceremony occurs the Friday following Thanksgiving, and this fun-filled event, includes: a town parade, fireworks, and special candles given to residents and visitors from local shop owners. There are currently 150 dealers all around the United States, and we would love to have you as part of this amazing team.See the dealer locator page to find a dealer near you. For more information about the company, and to find out more about how to bring the highest quality of American made spa covers to your customers near Coeur d’Alene, please call: 208-772-9176, or fill out the simple “new dealer registration” form.